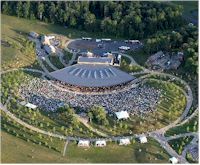 Bethel Woods Center for the Arts is a world-class cultural center that presents innovative, captivating performances, exhibitions and programs of the highest quality. The not-for-profit Center is located at the site of the 1969 Woodstock festival in Bethel, NY. It is a cultural center that inspires creative expression and civic engagement to enrich the human spirit. Located just 90 minutes from New York City on 800 acres of manicured grounds, the center offers multiple stages featuring a diverse selection of popular artists and culturally-rich performances, an award-winning museum, and educational and community programs that provide meaningful experience in arts, history and civic engagement. The Bethel Woods Center for the Arts is one of the top New York City venues for concerts and other events. Don't miss some of the biggest names in music as they come to New York City area's Bethel Woods Center for the Arts to perform live.